CREATe has been included in The University of Glasgow’s Research Beacons — six cross-disciplinary areas of research excellence that have attracted major external investment. The aim of these themed areas of research is to raise the profile of the institution with key audiences and to strengthen further the global reputation of the University’s research. The Research Beacons bring together inspiring researchers from across the University who are working with other institutions, funders, practitioners, policy makers and charities to address grand challenges that have impact on both a national and international scale. “We develop digital methods to enhance research. We are creating and applying unique, interactive digital tools and resources to generate and share our research. We support the global cultural and creative economy. Through our Centre for Cultural Policy Research, we contribute to public debate, and inform policy development throughout the world. 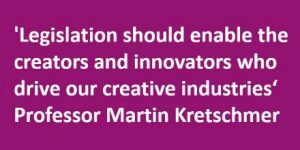 CREATe, our international research centre specialising in copyright and information law, focuses on innovation in the creative economy. Information about the Research Beacons is available here.